Boy, oh, boy– what a fun meetup we had yesterday in the Garment District! I wish all of you could’ve been there (think how fun it would be to descend en masse on poor, unsuspecting 39th St., snatching bolts of fabric and haggling until the shopkeepers collapse from the onslaught of hundreds of passionate sewists!)! Kerry and Liz searching for the perfect print (note Kerry’s Picnic Blanket Skirt and Liz’s Hazel dress!). Our guests of honor were Kerry and Liz, both of whom were serendipitously visiting the city from afar on the same weekend (so exciting!). Kelli also receives a special mention– she moved to NYC earlier this month, and this was her first trip to the Garment District (welcome!)! Also in attendance were New Yorkers and Garment District Pros Janice, Cindy, Marina, and Mika— what a fab group! Janice brainstorming uses for this amazing border print! We started at Paron, where we poked, prodded, and pulled out just about every bolt in the house, then we moved across the street to Gray Line Linen, a new-to-me and lovely store with gorgeous linen and reasonable prices (thanks for the suggestion, Cindy!). 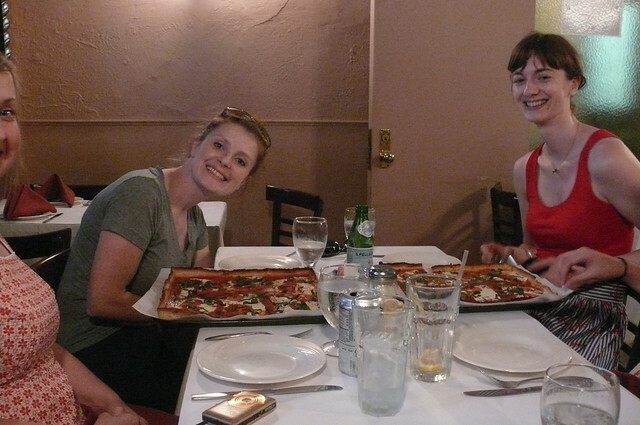 After raiding Chic Fabrics, we stopped for lunch at Lazzara’s (recommended by Shop the Garment District), and after a few slices, we were recharged and ready for Mood! We stayed at Mood until closing time, then paused to caffeinate and show off our purchases. Kelli and Kerry are excited for pizza time! All in all, we spent around 6 hours together, and the time passed so quickly! It was so fun to meet everyone, especially since I’ve been reading these ladies’ blogs for quite a while! Each gal was so fun, interesting, and easy to talk to. It was just so fun to meet people in real life, and to geek out over fabric with fellow enthusiasts. 🙂 I can’t wait to see what you guys make with the fabric you picked up this weekend! Mika shows off her fabric… won’t this make a super cute bow blouse? And look, it’s a Chantilly dress! What about you, readers? Any fun meetups happen lately (or do you have any on the horizon?)? 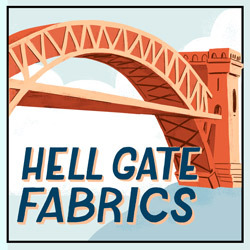 Any exciting fabric purchases or new sewing plans? I keep dreaming of the day I will finally visit the garment district. I am still trying to convince myself that I am not jealous of your meet-up. I almost succeeding too, almost. Your meetups looked so fun! I’d LOVE to meet you in real life– maybe someday we’ll make that happen! So exciting! I wish such a great sewing community existed where I live! 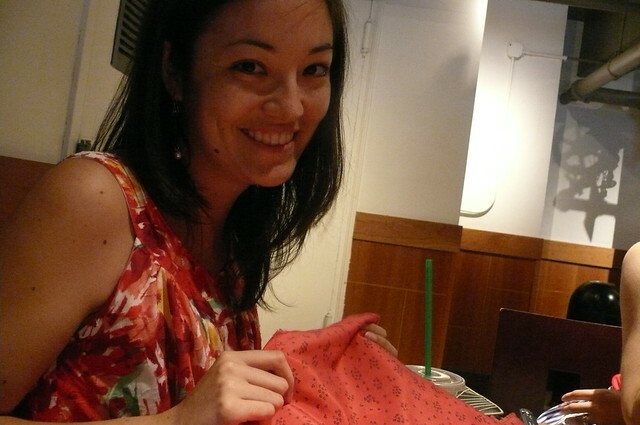 Tomorrow I plan to visit few textile shops in Paris! YAY! Ooh, I’m so jealous! Tissus Reine, I hope?! Thanks so much for organising! It was great fun. I’m so glad you came! What a great day! Looks like fun! I’m bummed that I wasn’t able to join you all, especially since I’m a short train ride away! One of these days I’m going to make it up there and meet you all in person! Ooh, someday! That would be so lovely! Oh what fun! I’m totally jealous, and can’t possibly think of a better way to spend the day! I hope your travels take you to NYC one of these days! Although I have to say that your South American trip definitely beats out NYC in the coolness department! Ahhh so insanely jealous of this hangout! I’ve never had a sewing blogger meetup or whatnot, I actually don’t even know any other Chicago bloggers. Looks like you guys had an awesome time…did you get anything? Ahh man, that’s a bummer! There’s gotta be some cool bloggers there– I know zilredloh is a Chicagoan! I restrained myself… I told myself I was only going to get black voile that I needed for a specific project, but I found some amazing rust-colored linen with a sort of southwestern print that I just couldn’t pass up! Meg the Grand is a Chicagoan and she’s awesome! Meg the Grand and Zilredloh both live in Chicago and regularly hold get togethers / sew-ins / lessons for newbie sewing friends. Check out their blogs; I’m sure they’d love someone new to join in! I’ll be in Chicago next month & I’m planning on meeting up with some bloggers 🙂 You should join us! Ooh fun! You guys will have a blast! They really are! Such fun! 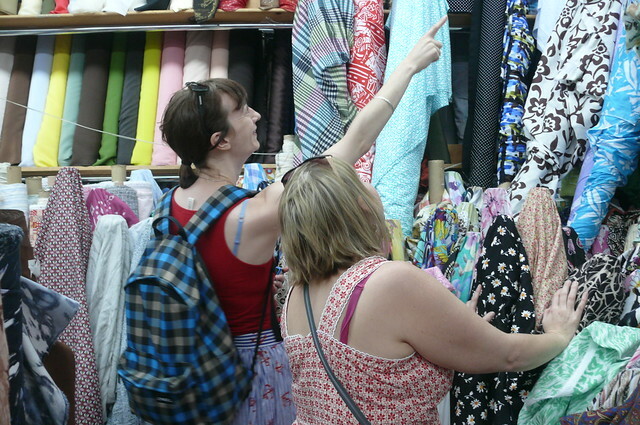 Your fabric shopping day looks like a hoot! It’s so fun to meet people when you’ve been sort of getting to know them online for so long! I had a great time meeting everyone! We should definitely do this again. It looks like ya’ll had a super fun day! I wish I could come play. One of these days! If we ever are both in the same town, it will be EPIC! How awesome! I’m so jelly!!!!! Crappers! Next time for sure! Oh my god! There’s Kerry! In New York!!! When I saw her, it was in Edinburgh, Scotland. That’s so crazy. I love seeing all this. She’s everywhere! I felt like I was meeting a celebrity! Wow! What a fabulously brilliantly amazing day! You look like you all had a blast! We really did! It was such fun to gab and shop all day! I feel quite lucky to have access to so many shops! Wow what a blast. My brother is living in NY so I’m hoping a visit sometime. Would love to meet up too. I would LOVE to meet you!!!!! Oh man, I’m so jealous of the fabric choice there! I still haven’t found the fabric treasure troves in my new home, sadface! Oof, I hope you find some lovely shops in Surrey, and I hope you’re settling in nicely! HAHAHAHA, don’t all menfolk love sewing meetups (and/or arranging their schedules to accommodate them)?? Hope you had happy hunting today! 🙂 So nice to meet you! Ooh! That sounds really fun! What pattern are you planning to use? How fun! So jealous of your meet-up that also just happened to be in the garment district – someday! Someday I’ll make it out there! I’ll be in Chicago next month, planning a little meet-up myself. I’m so excited, I can hardly contain myself hahaa. That would be so amazing! I would seriously go crazy if I met you in real life! Eat lots of good food when you’re in Chicago! I grew up nearby, so it’s dear to me and I miss the eats! Yay! I’m so glad! I LOVED your playsuit, and it was so fun to meet you in real life! I’m drooling over the pizzas! They look amazing. It looks like you all had a great time! Crimeny. I literally drooled on my phone looking at those photos of all the beautiful bolts of fabric. That’s what happens when you live in NE Florida and there ain’t a fabric store in sight! Even Joann’s is 45 minutes away. Sighhhhhhhhh. Thank the gods for the interwebs. Sounds like it was a lot of fun! I have to admit I’m kind of jealous… I’d love to do a meetup sometime. Maybe one of these days for an NYC one. It’s only something like a four-hour trip….each way….not unreasonable, right? It looks like everyone had so much fun and got some great goodies!! wow! looks like such fun! I didn’t sew when I lived in NYC, but on my next trip, I’m definitely clearing a day to hit the garment district shops. (though I’ll probably just panic from too much choice, and will come home empty handed). Ooh, I didn’t know you used to live in NY! How fun! Wonderful blog post on the Garment Center! Next time you should check out a factory! Email us at info@savethegarmentcenter.org, and we can try to help you set that up! Please post your Garment Center fun on our facebook page as well! http://www.facebook.com/savethegarmentcenter! Erica, we would have SO much time visiting a factory! I would LOVE that! As an NYC girl, I’m sorry I missed out! Next time, I’m in! Aw man, next time for sure!